The horse is an odd-toed ungulate mammal belonging to the taxonomic family Equidae. The horse has evolved over the past 45 to 55 million years from a small multi-toed creature into the large, single-toed animal of today. Humans began to domesticate horses around 4000 BC, and their domestication is believed to have been widespread by 3000 BC. Horses in the subspecies caballus are domesticated, although some domesticated populations live in the wild as feral horses. These feral populations are not true wild horses, as this term is used to describe horses that have never been domesticated, such as the endangered Przewalski's horse, a separate subspecies, and the only remaining true wild horse. Horse breeds are loosely divided into three categories based on general temperament: spirited "hot bloods" with speed and endurance; "cold bloods", such as draft horses and some ponies; and "warmbloods", developed from crosses between hot bloods and cold bloods. 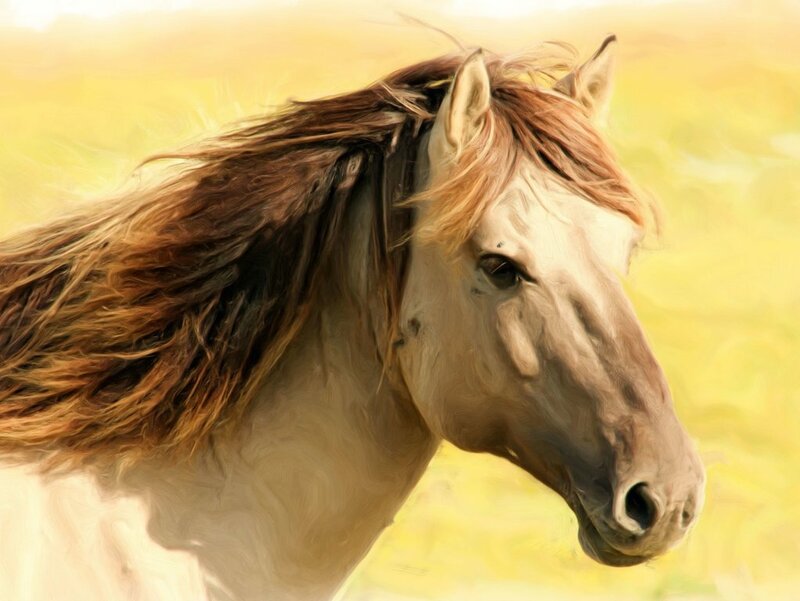 "Hot blooded" breeds include "oriental horses" such as the Akhal-Teke, Arabian horse, Barb and now-extinct Turkoman horse, as well as the Thoroughbred, a breed developed in England from the older oriental breeds. Hot bloods tend to be spirited, bold and learn quickly. They tend to be physically refined - thin-skinned, slim, and long-legged. Muscular, heavy draft horses are known as "cold bloods". They have a calm, patient temperament; sometimes nicknamed "gentle giants". Well-known draft breeds include the Belgian and the Clydesdale. Some, like the Percheron, are lighter and livelier. Others, such as the Shire, are slower and more powerful. The cold-blooded group also includes some pony breeds. "Warmblood" breeds are a cross between cold-blooded and hot-blooded breeds. Examples include breeds such as the Irish Draught or the Cleveland Bay. There are more than 300 breeds of horse in the world today. Horses are herd animals, with a clear hierarchy of rank, led by a dominant individual, usually a mare. They are also social creatures that are able to form companionship attachments to their own species and to other animals, including humans. They communicate in various ways, including vocalizations such as nickering or whinnying, mutual grooming and body language. When confined with insufficient companionship, exercise, or stimulation, individuals may develop stable vices, stereotypies of psychological origin, that include wood chewing, wall kicking, "weaving" (rocking back and forth), and other problems. They excel at simple learning, but also are able to use more advanced cognitive abilities that involve categorization and concept learning. They can learn using habituation, desensitization, classical conditioning, operant conditioning and positive reinforcement. Domesticated horses may face greater mental challenges than wild horses because they live in artificial environments that prevent instinctive behavior while also learning tasks that are not natural. The wild horse (Equus ferus) is a species of the genus Equus, which includes as subspecies the modern domesticated horse (Equus ferus caballus) as well as the undomesticated Tarpan (Equus ferus ferus), now extinct, and the endangered Przewalski's horse (Equus ferus przewalskii). The Przewalski's Horse was saved from the brink of extinction and reintroduced successfully to the wild. The Tarpan became extinct in the 19th century. Since the extinction of the Tarpan, attempts have been made to reconstruct its phenotype, resulting in horse breeds such as the Konik and Heck horse. However, the genetic makeup and foundation bloodstock of those breeds is substantially derived from domesticated horses, and therefore these breeds possess domesticated traits. The term "wild horse" is also used colloquially to refer to free-roaming herds of feral horses such as the Mustang in the United States, the Brumby in Australia, and many others. These feral horses are untamed members of the domestic horse subspecies (Equus ferus caballus). Horses are exploited by the unethical horse racing industry. Commercial horse racing is a ruthless industry motivated by financial gain and prestige. Cruelty, slaughter, injuries and accidental deaths are common. Horses are pushed to their physical limits and beyond, all for profit. Some horses are raced when they are under three years old, leading to fractures. Horses are drugged so they can compete with injuries, or given prohibited performance enhancing drugs. Jockeys often whip horses. The racing industry breeds thousands of horses looking for its next champion, contributing to an overpopulation crisis. Loosing and winning horses are commonly sent to the slaughterhouse when their careers have ended. While no horse slaughterhouses currently operate in the United States, American horses are still trucked over borders to slaughtering facilities in Mexico and Canada. Horses suffer horribly on the way to and during slaughter, often shipped for more than 24 hours at a time without food, water or rest. Horses are often injured even before arrival due to overcrowded conditions during transport. The methods used to kill horses rarely results in quick deaths: they often endure repeated stuns or blows, and sometimes remain conscious during their slaughter. Horses are forced to pull oversized loads by the animal entertainment industry. Carriage horses are forced to perform in all weather extremes. They face the threat and stress of traffic, often working all day long. The horses suffer from respiratory ailments from exhaust fumes, and develop debilitating leg problems. Carriage horses also face the threat of heatstroke from summer heat and humidity. Living conditions for these animals are often deplorable. When the horses grow too old, tired, or ill they may be slaughtered and turned into food for dogs or zoo animals, or shipped overseas for human consumption. The animal entertainment industry also uses horses in rodeos. They are abused with electrical prods, sharp spurs and "bucking straps" that pinch their sensitive flank area. During bucking events, horses may suffer broken legs or run into the sides of the arena causing serious injury and even death. Each year, hundreds of wild (feral) horses are rounded up by United States government agencies using inhumane methods. The horses are put in holding pens where, for a small fee, anyone can "adopt" them. The lucky ones are adopted by people who love and care for them, but many are traded or sold at auctions. Some are sent to Canada or Mexico to be slaughtered for their meat. The Horse Protection Act is a federal law that prohibits sored horses from participating in shows, exhibitions, sales or auctions. Soring is a cruel and abusive practice used to accentuate a horse’s gait. It is accomplished by irritating or blistering a horse’s forelegs with chemical irritants (such as mustard oil) or mechanical devices. The Horse Protection Act also prohibits drivers from transporting sored horses to or from any of these events.